To be honest, a lot of us had our doubts about the 2018 DC Pen Show. Last year’s show was a near train wreck at the start. So, we waited with baited breath to see if it was a harbinger for a disaster for this year’s show. It was NOT. Here’s ThePenMarket.com table in action at the 2018 DC Pen Show. Check out our killer location on the wall by the side doors to the ballroom! 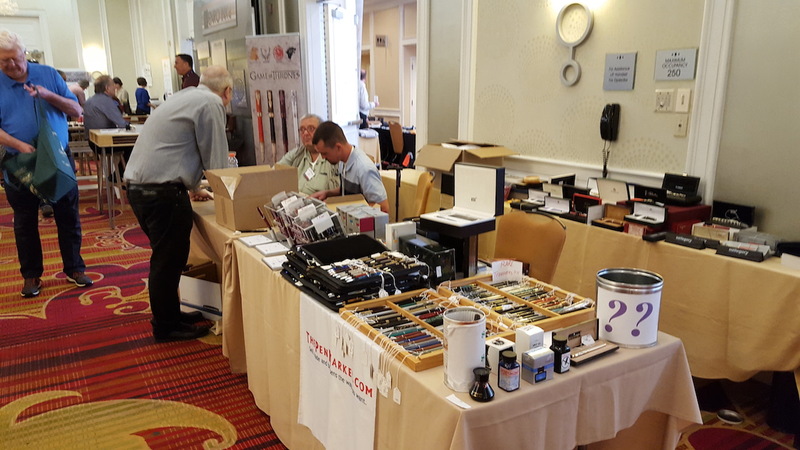 The 2018 DC Pen Show was a fun, well-oiled machine! Well organized and well advertised, this year’s show dazzled. Members of the pen community, old and new, hobnobbed and shared in 4 full days of inky geek love. But, I’m getting head of myself. The drive was actually uneventful for a change. No blowouts, thunderstorms or tornados. It was really challenging driving in dry, sunny conditions. As no show would be complete without a battlefield visit, I returned to Manassas/Bull Run for the first time in more than 30 years. It seemed much bigger when I was a kid. While the first land battle of the Civil War did range over several miles, the park focused on the epicenter of the battle. The gently hilly terrain really played a significant part of the battle…as did inconsistently colored uniforms. I remember marveling up at the big bronze statue of Gen. Stonewall Jackson as a kid. It really commands the view of the battlefield, but as an adult the statue looked comical, as Jackson’s biceps are seemingly 3 times larger than his head. Not even Superman is that out of proportion. Overlooked is the battle of 2nd Manassas, which took place a little more than a year after the first. Just down the road from the original battle site, the second battle was another victory for Jackson and the South, setting up the battle of Antietam a short while later. A little more isolated that first Manassas, the battlefield seems better preserved and very soothing to visit on a sunny afternoon with all of the cicadas and grasshoppers warming up for the evening, as tall grasses and wildflowers sway in the breeze. Hallowed ground for certain. 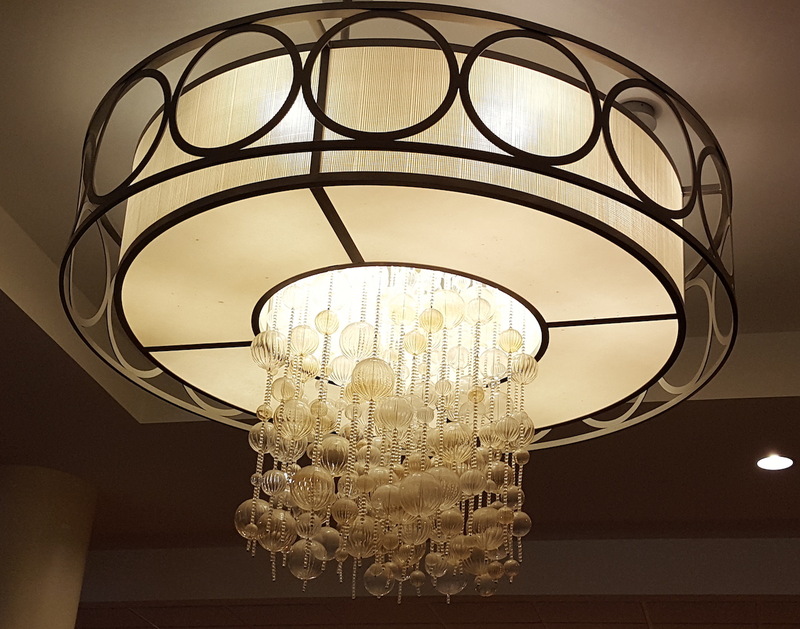 I love these chandeliers hanging in the ballrooms of the hotel at the DC Pen Show. It has a certain jellyfish quality to it. The pen show was great. My friends and I arrived to be among the first to set up Thursday morning on the free-for-all no table assignments day. As the day sped by, more vendors set up temporary shop and weekend pass holders got first crack at some phenomenal pens. This is the day to be there for vintage pen fans. About 2 hours before tear down, it was like a huge family reunion, as I met with and talked to friends from all over the U.S., Canada, Croatia, Czech Republic and Russia. It is quite possible I left out a few countries, but it is unintentional. Friday got an early jump. My fellow vendors started arriving around 8:30 in the morning, AND we already had table assignments waiting for us. It was great to set up before the crowds rushed us. But, rush us, they did. I got so busy setting up and helping early customers that I totally forgot to move my car from under the portico to a real parking space! Thank goodness the hotel didn’t have my car towed! My roommates and friends gave me well-deserved hell for it for the rest of the weekend. Saturday was a blur, but, at one point, I got to host my first repair seminar with pen tool genius Dale Bebe. We had an hour to explain the fundamentals of restoring a lever-filler pen and what tools to achieve our goals. How busy does the DC show get? This is how full it was before it officially opened for the day! As I did that my friend Neal S. watched my table with stunning success, really helping me while I was away. That night, I made my annual pilgrimage to the Black Pen Society meeting. Yay, scotch and cigars. Sunday was a busy morning, and then–just like that–it was all over. It was time to say farewell and pack up all my troubles in my old kit bag. Monday, I finally got to play tourist in our nation’s capitol. I took my first Metro ride downtown to the National Mall. (The Metro is way cleaner than the El in Chicago…smoother riding, too.) 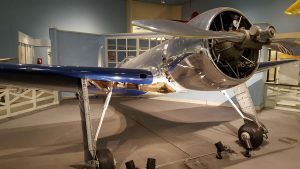 My destination was a 30-year bucket-list museum: The Smithsonian Air & Space Museum. Howard Hughes broke both speed and distance records with this graceful, slick art deco wonder with wings. FIRST, it looks nothing like “A Night at the Museum” with Ben Stiller and Amy Adams. I was very disappointed about that…and no Amy Adams-portrayed Amelia Earhart flirting with me. Once I got over that, I enjoyed the surprisingly small museum. Impressive were the original Wright Flyer, Glamorous Glennis (the first plane to break the sound barrier), authentic V-1 and V-2 rockets and missiles from WWII and myriad other aircraft. Yet, what really spun my prop was Howard Hughes’ HB-1 plane circa 1935 that broke all of the then-known speed records. A precursor of the Bee-Gee, this plane was as fast and sleek looking as any plane on display! I loved it and a 1930s plane that was the first to fly across all of Antarctica. To my greater surprise, my favorite exhibit looked at the history of navigation! I actually learned how to use a sextant and a chronometer to find my global position using stars at night! Now I kinda wanna roam around the country with a sextant and calculating my position on earth. The display moved through the years, also discussing how early pilots had to use the sun and a modernized sextant to navigate before radio beams could be used and then, ultimately, satellites. Another great trip in the books. 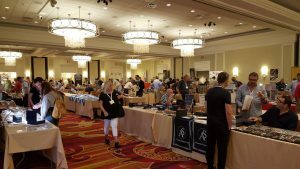 This entry was posted in Pen News and tagged #luxurypens, #vintagepens, Air and Space Museum, art deco, DC Pen Show, Howard Hughes, luxury pens, Mont Blanc, Parker, Sheaffer, Smithsonian, vintage pens, Washington D.C. Pen Show, Waterman. LeBoeuf on August 9, 2018 by Nathaniel Cerf.